Lendl Simmons adjudged the Man of the Match. Scored 66 runs off 43 balls. Not to forget the catches he took to dismiss Sanju Samson and Rishabh Pant - the two heroes for Delhi from the previous match. OUT! Zaheer hits Karn Sharma straight. Typical tail-ender's shot. 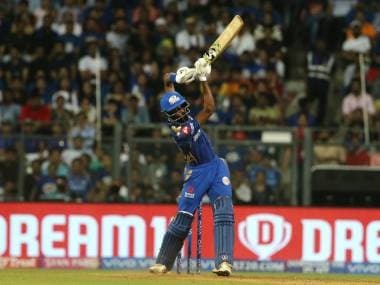 Nitish Rana juggles it at long on but holds on. DD all out for 66. Cummins to bowl the lat over of the innings. The first ball is an attempted wide yorker, ends up as a wide low full toss. Polard opens the face of the bat and gets it to the extra cover fence. The next ball is also a full toss. Gets awaY with that. Pandya slashes at the third delivery. Four. Goes ove backward point. 2 runs away from 200. Pandya goes down the ground and that is 200 up for MI. A 78 metre six. The big screen says 'Hard hit Pandya'. Apt! Fifty-run partnership up between Pandya and Pollard too. Cummins responds with a bouncer. Pandya looks to hook it away. Misses. Wide called though. Cummins will have to rebowl that. Pandya goes after the bowler. Short of a length, pulled over depp mid wicket. SIX! Cummins will look to end well. He is under pressure. Bowls a wide. The last ball is sort of a face-saver for Cummins. In a good channel. Pandya plays and misses. This is a really strong finish for MI though. The Pandya-Pollard partnership was worth 59 runs off 27 balls. Mumbai end up with a mammoth 212. Task cut out for DD, but what it means is that we may see another mighty charge by Rishabh Pant and Sanju Samson blinder. They would have to go after the MI bowling of they have any hope of overhauling this huge total. A note of caution for Pant and Samson though - Mumbai's bowling is far stronger than that of GL. 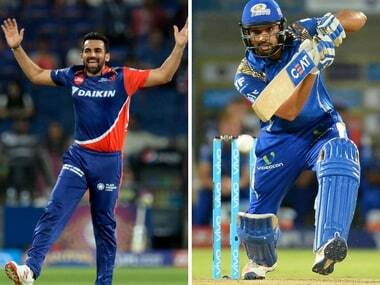 Changes for MI - Harbhajan Singh in place of Krunal Pandya, Lendl Simmons in for Jos Buttler. Change for DD - Zaheer Khan returns to captain the side. He comes in place of Shahbaz Nadeem. Zaheer is beaten on the first three deliveries. Tries to hit out on the fourth. Skies one to long on. Nitish Rana takes the catch. That's the match for Mumbai Indians. They are the first team now to qualify for the play-offs. DD lose by 146 runs. That is the biggest margin to lose for any team in the IPL, beating the 144-run loss for Gujarat Lions last season. A fantastic win for DD in the previous match, but a terrible loss here. It all gets a bit tough for them to qualify fo the knock outs now. Mumbai Indians become the first team to qualify for the play-offs in this season of IPL. Hardik Pandya in for his first over of the match. Pandya to Zaheer. The fourth ball is a well-directed short ball. Zaheer somehow evades it. Just two runs from the over. Karn Sharma in to bowl the 12th over. Starts with a wide. Bowling with a leg slip and two slips. Beats Mishra with a beauty. Turns just a shade after pitching. Beats Mishra's outside edge. Not far from the off stump too. Six runs from that over. Harbhajan in for the 11th over. Shami sends him over the long on boundary. SIX! But perishes trying to repeat the feat. Pollard takes it comfortably at long on. Huge hands! Zaheer Khan out in the middle. Delhi tottering on the brink. Eight runs from that over and a wicket. Karn Sharma in the attack. Raps Mishra on the pads. Big appeal. Not out. Sharma gets Rabada with a beauty on the 4th ball. A googly and Rabada edges to slip. Out for a duck. Mohammad Shami the next man in. MI operating with two slips now. DD bring up their fifty in the 10th over. Finally! Harbhajan comes in to bowl and gets carted by Cummins over cow corner for a six. The next delivery gives glimpses of Bhajji during his peak. A great length and the ball turned a shade after pitching. Kissed the outside edge of Cummins's bat. Good catch by Parthiv behind the stumps. Timeout taken. Amit Mishra is the new man in. One run off the next four balls. Seven runs off that over. Karn Sharma into the attack. The highlight of that over has to be one of the catches of the tournament. A screamer from Rohit Sharma. At full stretch and one-handed. You won't see a better catch. This will rival the one by Anderson the other day. Delhi sink deeper. Kagiso Rabada in as the new man. A change here, a change there, and chasing 200 for a second game running is too much for DD. Should be curtains for their 2017 IPL campaign. Harbhajan continues. Two new batsmen at the crease. MI would look to get a few overs quickly out of the way and not concede too many. Good variation by the wily off spinner. Cummins gets hit on the body as he swings and misses. Was a bit to early on the shot. An appeal. But not out give. Only two runs from that over. MI have Delhi under a tight leash. Malinga comes in for his second over. Anderson gets a four off the second ball, but then Malinga gets his man. Fifth ball of the over. Anderson pulls and tries to send one into the stands. It is high, but not long enough. Karn Sharma takes the catch at long on. Delhi is complete disarray now, at the end of the powerplay overs. Pat Cummins joins Marlon Samuels in the middle. Delhi's hopes rest on Samuels now. Harbhajan comes into the attack. Anderson gets a bottom edge for a boundary, but then Bhajji gets rid of Nair. A soft dismissal as Nair hits one straight to Rohit at mid wicket. Appeal for LBW off the last ball. Not out given. Fine runs and a wicket in that over. Bumrah into the attack now. The second ball is a bit short and has Pant pulling. He didn't get the distance. Easy catch to Simmons at deep mid wicket. Simmons is everywhere. But that's a killer blow for Delhi. The hero of the previous match is gone. What a leveler this game is. Corey Anderson the next man in. Bumrah bowling with a slip. Bumrah to Anderson on the fifth ball. Anderson wanted to leave that ball, but the ball gets deflected off his bat. That could have gone anywhere. A last ball has Nair playing a ramp shot that goes over the keeper and goes towadrs the fine leg boundary. McClenaghan continues. Nair drives the first ball to mid on. Was a bit uppish. Nair gives himself room and gets the third ball of the over past the wicket keeper and gets a boundary at third man. Four off the next delivery too. This time at mid wicket. Slower delivery picked up by the batsman. Delhi is getting a move on. Nair is then beaten on the pull, but the last ball travels the distance. Slapped for six over midwicket. 14 runs from that over. Lasith Malinga - the MI legend - is in to bowl the second over of the innings. Starts with a length delivery, followed by a shortish one. Nair tries to pull the next ball. Misses and the ball deflects off his body. One leg bye. The fifth ball is banged in short and Iyer goes for the pull. He totally mistimes it, getting a top edge. Iyer was late on the shot. The ball balloons in the air. The simplest of catches for Harbhajan Singh at mid wicket. Rishabh Pant, the hero of the last match, comes out to bat and plays a good-looking shot off the first ball he faces. The first ball is heaved away by Samson in front of square. He uis on the attack from the word go. Chance for Simmons though. Amnd he takes the catch. Disastrous start for Delhi. And it is a huge wicket. Simmons is having a great game. Shreyas Iyer is the new man in. Iyer cuts the third ball. Uppish. Good fielding in the deep. Four runs and a wicket from the first over. Right then. All set for the Delhi chase. Sanju Samson and Karun Nair out at the centre for Delhi. Mitchell McClenaghan has the new ball for Mumbai. Rabada to Pandya. A play and a miss off the first ball. Pandya gets one high on the bat next, mistimes, but Iyer makes a mess of the catch at mid off. Another catch goes down in the IPL. How many have there been this tournament. The catching has not been good at all. And the MI batsmen run three. Two wides next. Rabada comes back well with a fine yorker off the fifth ball and has Pandya playing and missing the last ball. Another yorker. Seven runs from the over. Very good for DD in the context of the match. Anderson comes in for the 18th over. Starts with two wides. Anderson to Pandya. Second ball of the over and Pandya blasts it over extra cover and into the fence. Four! Pandya skies the fifth ball, but it lands safely. Pandya did not pick the off-cutter. The last ball of the over is blasted through long on. The ball was angling away from Pollard and he goes aerial and gets four. Cummins into the attack. The first ball is wide and almosr yorker length. The next ball is wide and moving away. Called a wide. Cummins then bowls another wide and full one. Pollard gets an inside edge. A single. Cummins to Pollard, who moves way outside his off stumps, to put Cummins off his line and length, which has been full and wide. Mind games! The fifth ball is driven to cover. Zaheer has a shy at the stumps. Direct hit will be interesting. Zaheer misses and there is an overthrow. The last ball is hammered down the ground for a four and that's fifty for Pollard. Fifty off 29 balls. 200 looks a distinct possibility now. Rabada into the attack. Pollard turns him towards fine leg. Shreyas Iyer puts in a desperate dive at the fence. To no avail. Four! Pollard takes a single on the next ball. Rohit tries to pull the next ball. Banged in short and at good pace. Rohit not in control of that shot at all. Mistimes it in the air. Mishra won't drop that. Big wicket for DD. Timeout taken at the fall of that wicket. Hardik Pandya is the new batsman in. Seven runs and a wicket. A fine over by Rabada. Zak back. He had to, to stem the flow of runs. Good changes of pace in the over. Four runs off the first four balls. Pollard tries to play the 'Dilscoop' on the fifth ball, gets a thick outside edge, as the ball runs away to the boundary past the 'keeper. "Pollard showing his R-A-N-G-E," says Sanjay Manjrekar on commentary, careful that it does not sound like 'brain'. Doesn't want another controversy. Nine runs from that over. Mishra continues. Pollard smokes him for two sixes in the over. One over long off, another over long on. Massive hits those. Rohit gets three runs with a delicate dab past the keeper. Mishra feeling the pressure. Bowls a full toss on Pollard's pads. Lucky to get away with it. 17 runs from that over. Mishra completes his quota. Went for 37 runs in his 4 overs. More expensive than he would have liked. Corey Anderson into the attack now. The second ball is short both in length and pace and Simmons sends it over mid wicket and into the stands. The next ball has Simmons on the attack again. Simmons swivels and hits it towards fine leg. But hits it straight at his West Indian team mate Marlon Samuels, stationed at 45 degree. Samuels juggles but holds on. Simmons would be cursing himself. A soft dismissal. Simmons could have gone on either side of Samuels and could have got a boundary. A big relieved smile from the bowker Anderson. He knows he was lucky and knows the value of that wicket. Rohit Sharma walks in at the fall of that wicket. The MI captain guides the first ball he faces backward off square on the off side. Two men dive - one at backward point another at short third man. Neither can't cut it off. Four. Two runs off the next two balls. 13 runs from that over. Cummins back in the attack. The first three balls produce two runs. The fourth ball is smoked over long on for a six by Simmons. Cummins rolled his fingers around that delivery, but Simmons picked it up. Takes a single to bring up 1,000 runs in IPL cricket - the second fastest after Shaun Marsh of Kings XI Punjab. The last ball is driven in front of square. Rabada does well in the deep. Two runs. 12 runs from that over. Mishra continues. Raps Simmons on the pads. VBig appeal. Not out given. The ball is gripping the surface. Simmons takes a single off the next ball and that's his fifty off 37 balls. The 10th IPL fifty for him. Pollard goes downtown off the third ball. SIX! Massive! Mishra comes back with a good leg break. The ball is really gripping now. Mishra to Pollard. The big West Indian miscues, but such is the power of the man and the so small is the ground that the ball easily goes over the fence. Mishra comes back well again off the last ball. That ball is tossed up and Pollard is drawn forward and beaten. Pat whips the bails off. Replays show Pollard had his foot in the air for a short while, but got his foot back in time. Mumbai Indians have played this beautifully. Lendl Simmons likes batting in India and he has shown why. Sending Keiron Pollard at no.3 shows their intent. DD could be chasing another tall score here. Shami to Simmons. There are two West Indians at the centre now. Simmons is looking to get after Shami, but this is high quality bowling from the India pacer. The third ball has Simmons playing early and getting an inside edge. Could well have dragged on to his stumps. He has to get back to his crease fast though, as wicket keeper Pant has a shy. No harm done for MI though. Simmons gets a good connection on the next ball. Goes over extra cover. Four! Gives the charge on the fifth ball. Single at cover. The last ball is a slower one. Pollard plays a bit too early. Mishra continues. Parthiv dances down the track on the second ball and plays it away towards deep mid wicket. The fourth bvall is a googly. Beautifully bowled. Draws Parthiv forward and beats him comprehensively. That's the worth of a leg-spinner in T20s. They are wicket-takers. Mumbai lose their first wicket and Kieron Pollard comes in at the fall of that wicket. Mumbai clearly is looking to up the ante. Three runs and a wicket from that over. 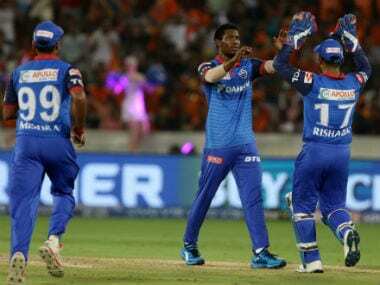 Preview Resurgent Delhi Daredevils (DD) will like to continue their winning momentum when they take on Mumbai Indians in an Indian Premier League (IPL) match at the Ferozeshah Kotla here on Saturday. With two back to back wins at home, Delhi, who are sitting at the sixth spot, may still find themselves with a slim chance to qualify for the play-offs. 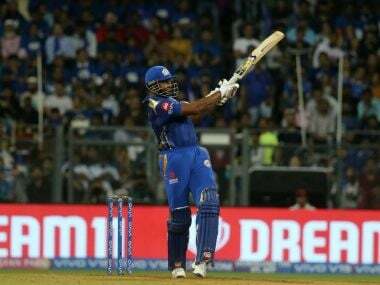 On Thursday, chasing a mammoth 209, the left-right combo of Rishabh Pant (97) and Sanju Samson (61) hit the Gujarat Lions bowlers all over the park to raise a 143-run stand off mere 63 balls to overhaul the target with 15 balls to spare. Going into Saturday's tie, Delhi will once again hope for a good start by the top order, comprising the likes of Sanju Samson, Karun Nair, Shreyas Iyer and Rishabh Pant. The middle order boasts of the big-hitting all-rounder duo of Chris Morris and Corey Anderson. Among the bowlers, pacers Pat Cummins and K. Rabada stood out with their immaculate line and length and were well assisted by senior leg-spinner Amit Mishra. Mumbai, on the other hand, are also back from consecutive wins to find themselves sitting atop of the eight-team IPL standings. The visitors, who have qualified for the knock-out stage of the cash-rich tournament will have a slight advantage as their bowling department is strong unlike Delhi. 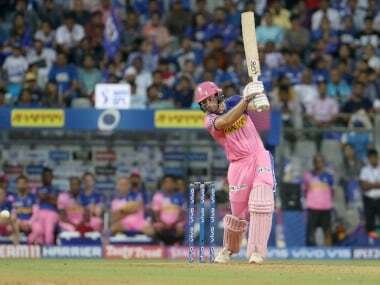 In the batting department, opener Parthiv Patel along with Jos Buttler, Rohit Sharma, Nitish Rana and Hardik Pandya are going through a purple patch that will surely help the visitors in outplaying the hosts. High on confidence after they edged past Gujarat Lions in a super over and then outplayed Bangalore by five wickets, the Rohit Sharma-led side will aim for another strong finish.